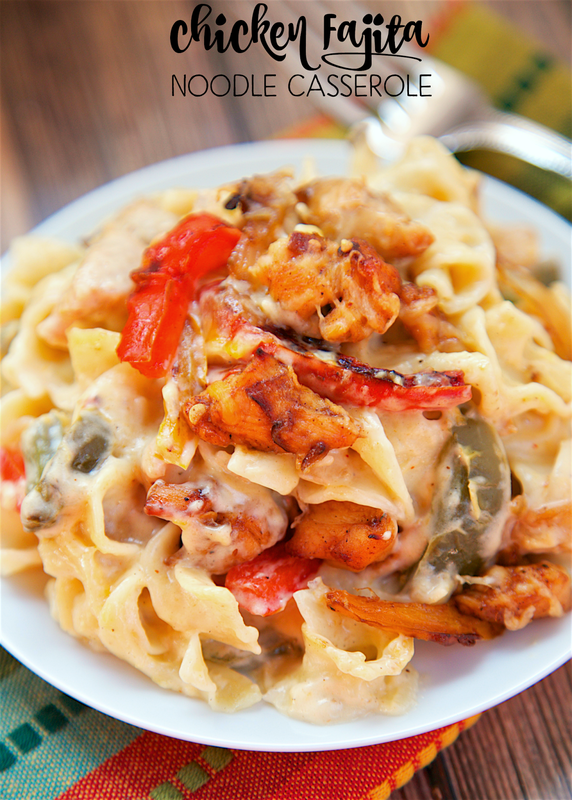 Chicken Fajita Noodle Casserole - chicken, fajita seasoning, bell peppers, onions, noodles, sour cream, cream of chicken soup and cheese. Seriously delicious! Can make ahead of time and refrigerate or freeze for later. Makes a lot - can split between 2 pans and freeze one for later. Everyone loves this casserole! We love making chicken noodle casseroles for dinner. They are easy to make and can be made ahead of time for an easy weeknight meal. 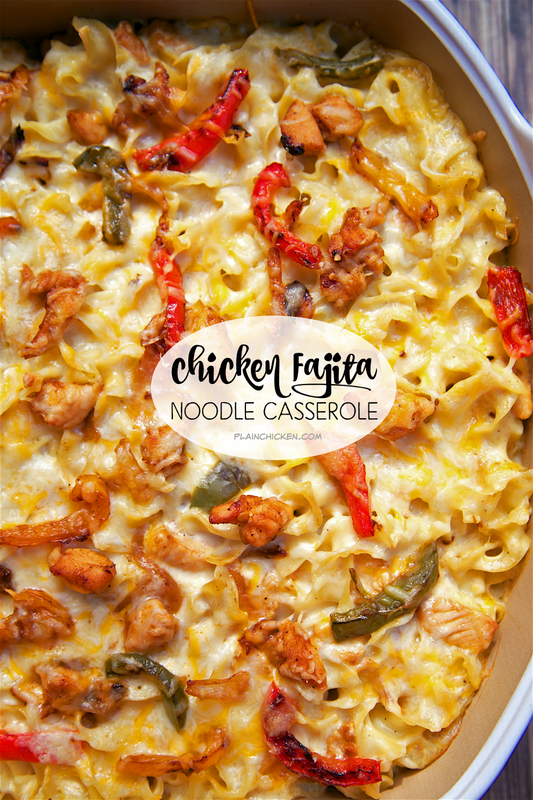 I was looking at all the chicken noodles casseroles on the blog, and realized that I didn't have a Mexican noodle casserole. I had to remedy that situation ASAP. I decided to make a Chicken Fajita Noodle Casserole. Chicken Fajitas are my favorite Mexican dish, so I was excited to see how the casserole turned out. Well, it turned out delicious! I mean seriously delicious! 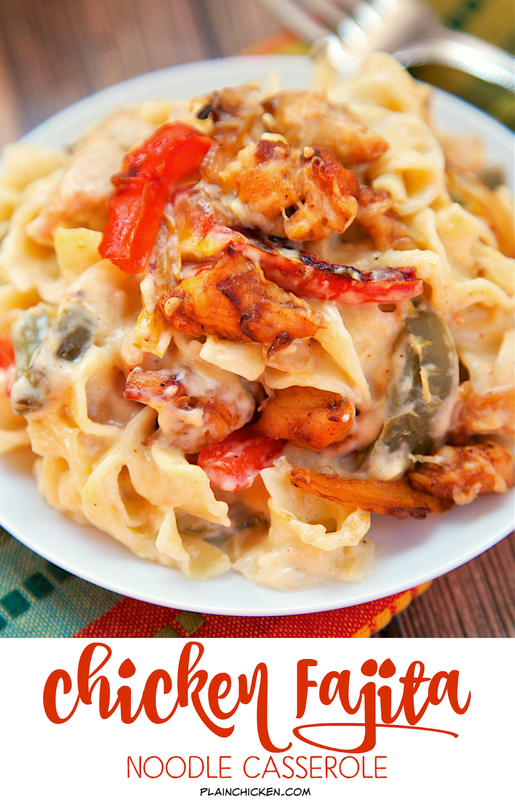 Chicken, fajita seasoning, bell peppers, onions, noodles, sour cream, cream of chicken soup and cheese! How could it be bad?!?!?! I used a package of No Yolks® Extra Broad Noodles in this casserole. 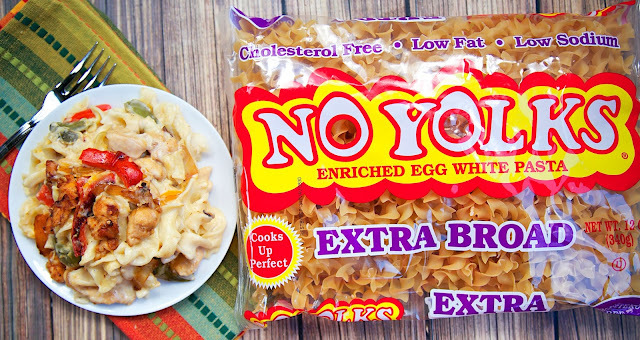 I love using No Yolks® in all my noodle casseroles. The noodles are cholesterol free noodles that are always smooth, firm and delicious. 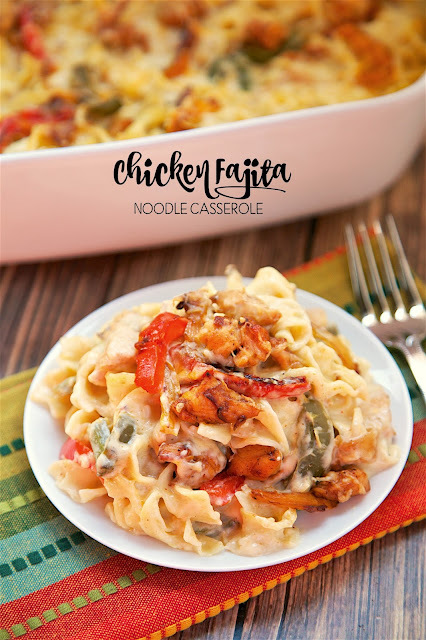 This Chicken Fajita Noodle Casserole can be made ahead of time and refrigerated or frozen for later. This makes a ton, so you can split it between two pans and freeze one for later. 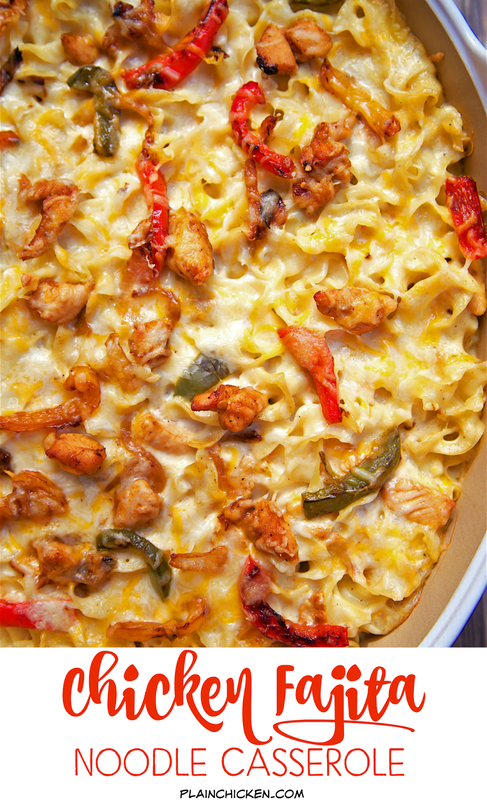 LOVE being able to pull a casserole out of the freezer for a quick weeknight meal! There’s No Yolks and No Other. Cook No Yolks® Extra Broad Noodles according to package directions. Drain and set aside. Cut chicken into small bite-sized pieces. Toss with fajita seasoning. Set aside. In a large skillet, heat olive oil over medium-high heat. Add peppers and onions. Cook for 3 to 5 minutes. Add fajita coated chicken and cook for an additional 5 minutes. In a large bowl. combine cream of chicken soup, sour cream and 1-1/2 cups of cheese. Stir in cooked chicken and vegetables. Stir in cooked noodles. Pour into prepared 9x13-inch pan. Top with remaining cheese. My favorite comfort food is homemade macaroni and cheese. So much baked cheesy goodness! My favorite is Buttermilk Chicken with mashed potatoes and gravy. My favorite comfort food is Chicken Noodle Soup. Thank you for the wonderful giveaway. My comfort food is turkey, black bean and sweet potato tacos. My favorite comfort food is LASAGNE! Any & all kinds. I like tuna noodle casserole with bread crumbs on top. My favorite comfort food is mac and cheese - homemade, of course, with breadcrumbs on top! I love any kind of creamy pasta recipe! I was going to say that Pot Roast is my favorite comfort food, but I might have to change my mind now that I've seen this recipe! YUM!! I love creamy chicken stew . I loved my mom's homemade chicken noodle soup! That looks delicious and the chicken looks perfect! My favorite comfort food is definitely homemade fettuccine alfredo! A delicious pot roast with mashed potatoes is my favorite comfort food! My favorite comfort food is actually a dessert, my homemade Dark Chocolate Stout Cake with Chocolate Buttercream. It has the ability to cheer me up whenever I'm down! I posted a tweet: https://twitter.com/FireRunner2379/status/705907489414500352. I love egg noodles with a creamy mushroom sauce. Yum! My favorite comfort food is Mac N Cheese! Lasagna is one of my favorite comfort foods! You can’t beat it with a piece of garlic bread! When I want comfort food, I think of things my Mom made, and my favorite is chicken noodle soup. She always served it with Club crackers, and I still do, too. My comfort food is Greek stew - it brings back happy memories. One of my fav comfort foods is Paneer Tikki Masala from my fav local Indian restaurant. Some days, you just need a big bowl of it! hahaha! Although I'm not a fan of most mac & cheese there is a little neighborhood cafe that has absolutely the best mac & cheese ever! And they only have it one day a week. My favorite comfort food recipe at meal time is Fried Green Tomatoes. There's nothing quite as comforting as chicken pot pie for me. My favorite comfort food is Chicken pot pie. Homemade chicken dumplings would have to be my favorite! My favorite comfort food is banana pudding. My favorite comfort food is Baked Potato Soup. My favorite comfort is PASTA alone or with just about anything.